﻿ Welcome to Universal Impact, Inc. 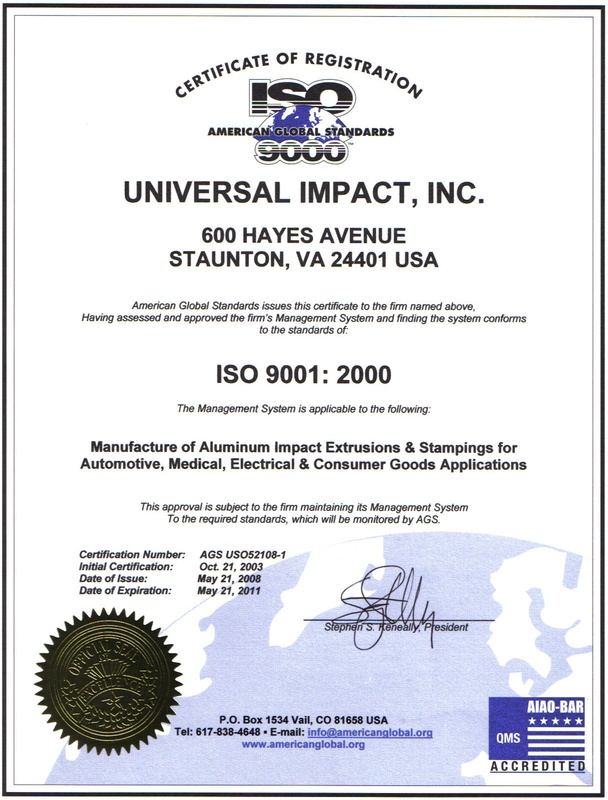 Welcome to Universal Impact, Inc.
Universal Impact, Inc. is a leading manufacturer of aluminum impact extrusions. Universal's operation is located in beautiful historic Staunton, VA. We currently occupy a 16,000 square foot plant. Through our innovation, versatility, and efficiency; we have become a leader in aluminum impact extrusions. All of our extrusions are manufactured to meet our customer's close tolerance specifications. We also provide secondary machining when required. Customized packaging for highly precision parts is also available. With our tool & die shop, we can manufacture your extrusion all in-house. Capable of large and small production runs. To name a few, our extrusions are used in capacitor, automotive, fire safety, compressed gas, and electronic applications. Feel free to contact us to discuss your design and manufacturing needs. All types of specialty cans. Universal Impact, Inc. manufactures the highest quality impact extrusions to meet and exceed our customers requirements. Copyright © 2010 Universal Impact, Inc. All Rights Reserved.